There are many unanswered questions as the 2018 campaign begins in earnest. First, experts disagree on whether federal and local candidates will emulate the unconventional media buying strategies employed by Donald Trump in 2016 by relying heavily on free “earned media” from tweets. Second, there is still some disagreement as to how much fundraising will rise or fall compared to previous years, given the increase in political activism immediately after last year’s election. Third, some believe analysis of early results of recent elections is a harbinger of the November elections in which Republican strongholds have elected a Democrat, such as Doug Jones in Alabama. The elephant in the room is control of Congress. Can the growing discontent in the United States result in the Democrats regaining the majority in both the Senate and House? Will candidates and Super PACs raise more money than previously recorded as a result? Therein lies the major driver that will determine political spending during the year. Other drivers that will contribute to the final political media buying total include a high number of toss-up gubernatorial races, controversial ballot initiatives, and the rising interest in which party controls the various state legislatures. In January when PQ Media first began monitoring the political races in earnest, we didn’t expect a major increase in political media buying in the Senate races, regardless that the Republicans hold a razor-thin 51-49 majority (Note: Independents included with Democratic Party based on voting record.). There are 35 seats being contested, but only nine have an incumbent Republican candidate, of which six are considered safe or likely to remain in Republican control, leaving only three toss-up elections (see below). Meanwhile, only five of the 26 seats with Democratic incumbents are currently considered vulnerable. Furthermore, within the eight contested states, only 13 DMAs are within the top 50 markets, including five in Florida and Phoenix, AZ ranked the highest at 12th, thereby leading most political media buying to markets with lower CPMs than seen in past elections. Of note, the Democrats seem to be losing ground here, as there were only four toss-ups in January, with Florida and North Dakota added in the past six months, while Minnesota was moved from toss-up to likely Democratic. Therefore, in order for the Democratic Party to take control of the Senate, it must hold onto to its five seats, as well as win two of the three Republican seats. If the Democrats win only one Republican seat, Vice President Pence will cast the deciding vote on any deadlocked issues, providing the Republicans with a little breathing room. PQ Media believes that fundraising for competitive Senate races became a larger issue after Justice Anthony Kennedy announced his retirement from the Supreme Court on June 27, effective the end of July, particularly given the recent contentious court rulings a few days before his announcement. In January, PQ Media believed that that there weren’t enough toss-up races to justify a significant increase in spending on House races. That is, the Republicans hold a 241-to-194 majority in the House, which would require the Democrats to flip a minimum of 24 seats during the 2018 elections to reach the 218-seat majority. In January the number of toss-up races were only 16, below the minimum the Democrats need to gain control of the House. In the months since, the Republicans have lost ground, and the minimum benchmark has been reached as of June 20 – 24 toss-ups, of which two are Democratic seats, as well as nine Republican seats that are trending Democratic versus only one Democratic seat trending Republican. Thus, there are 31 seats the Republicans could possibly lose in November versus only three seats for the Democrats. One pundit doesn’t believe the Democrats will be successful, rating 14 of the 31 races as tilting Republican, which would result in 226 Republican seats, eight above the 218 majority. There have been hints that fundraising began to increase in 2Q18, particularly after the controversial issue of separating immigrant children from their parents. That said, a majority of the contested House races will be in smaller DMAs; for example, the 19th congressional district of New York is in the Hudson Valley and Catskills region that is served by 59th ranked Albany. PQ Media believes there will be a slight increase in spending on gubernatorial races when compared with the 2014 election. We’re using the 2014 comparison versus 2016 because the number of campaigns rises in non-presidential election cycles – 36 in 2018 versus only 14 in 2016. Since January, many races have tightened, as only Republican-controlled Florida, Michigan and Nevada were considered toss-up states at the beginning of the year. In June, four more Republican-controlled seats have become toss-ups – Illinois, Iowa, Maine, and Ohio, as well as two Democratic seats in Connecticut and Minnesota and an independent seat in Alaska. The gubernatorial races differ from the federal races in that there are a high number of large DMAs in the mix, including Chicago, Miami, Detroit and possibly New York City if Connecticut candidates want to reach the affluent Fairfield County voters. 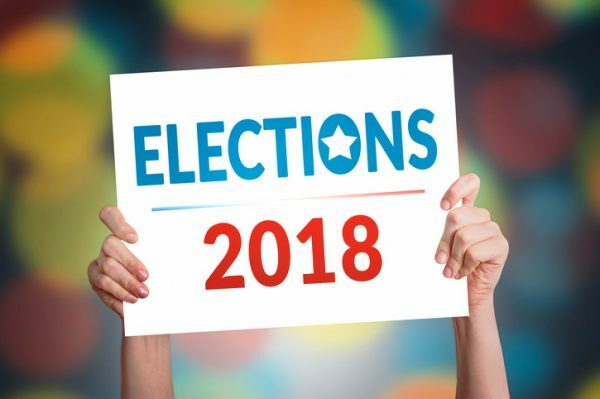 As to ballot measures, PQ Media expects significant funds to come from outside the states voting on controversial ballot referendums, such as abortion in Alabama, casino gambling in Florida, and marijuana in Oklahoma. As of June 20, there were only 110 ballot measures, significantly less than the 162 voted upon during the 2016 campaign. Finally, the Democratic upset earlier in the year in Wisconsin’s 10th district that Trump carried by 17 points, are leading some to believe that additional funds will be allocated to select local races if there is the possibility that control of a state legislature could change. Part one of PQ Media’s Political Insights. Next week’s post will cover radio’s role in political advertising. Previous Previous post: Radio on Main Street Podcast Featuring Dave Santrella, President of Broadcast Media at the Salem Media Group.